Risalah, Jurnal Pendidikan dan Studi Islam is published by the Faculty of Islamic Studies Wiralodra University Indonesia. 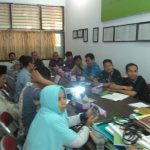 Focus of Risalah, Jurnal Pendidikan dan Studi Islam is on publishing original empirical research articles and theoretical reviews of Islamic education and Islamic Studies. The empirical research includes studies on the implementation of Islamic education in educational Islamic institution while theoretical study covers historical studies, expert finding and Islamic education content analysis from al-qur’an and hadist. Risalah, Jurnal Pendidikan dan Studi Islam it covers various issues on the Islamic studies within such number of fields as Islamic thought, Islamic law, political Islam, and Islamic economics from social and cultural perspectives. In Other than forementioned field in Islamic Education, Risalah, Jurnal Pendidikan dan Studi Islam, also accepts articles which cover the topic on the cross section between Islam Studies and other scientific field, such as sociology, law, economics, and others. 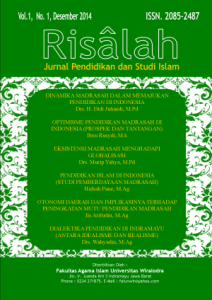 Risalah, Jurnal Pendidikan dan Studi Islam Published 2 (two) times annually, on June and December. Each of the issue has 10 articles both on conceptual article and research article. Risalah, Jurnal Pendidikan dan Studi Islam published in Bahasa Indonesia, but English-written articles are also welcomed.